Yukon Fitness COM-200 Commercial Cable Crossover Machine. Yukon's Cable Crossover Machine is an excellent addition to you home gym that will provide you with a wide range of body sculpting exercises such as; Cable Crossovers, one-arm rows, leg kick backs and incline flies. With a strong frame, Yukon's new design lets you exercise virtually every major muscle group in your body. 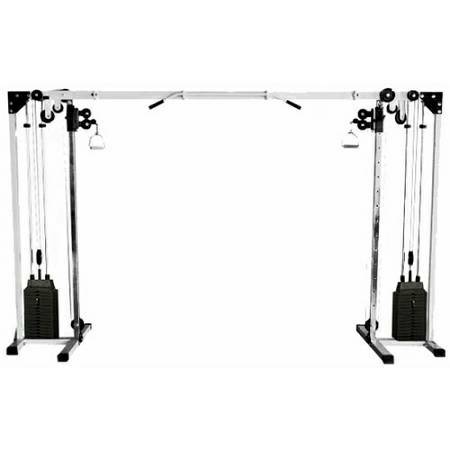 Interchangeable cable handles provide an unlimited number of possibilities for all experience levels, and the extra wide and tall mainframe provides you with easy access to an endless array of high and low pulley exercises. Has 14 height settings to adjust to any angle for any exercise. Perfect for fitness minded individuals serious about getting in shape. Yukon's Cable Crossover Machine will provide you with the tools to achieve your ultimate fitness goals. Multiple Adjustments on the Hi-Low pulley allow you to get a total body workout. With the addition of a bench, you can make almost infinite adjustments to achieve your targeted workout objective. Extra wide for the best range of motion. Constructed of 2" x 2" and 2" x 3" 11 Gauge Steel Tubing. Powder coated Finish to last a lifetime. Hi and Low Pulley with 180 degrees of movement provide endless choices of exercises. Includes with 2 chrome cable handles. Built in chin up bar. Built for serious cable crossover users. All pulleys are commercial fiberglass with sealed ball bearings providing a smooth feel. All cables rated 2000 lb. aircraft grade. Two 200# Selectable Weight Stacks included. Dimensions: 88" H x 166" W x 39" L.